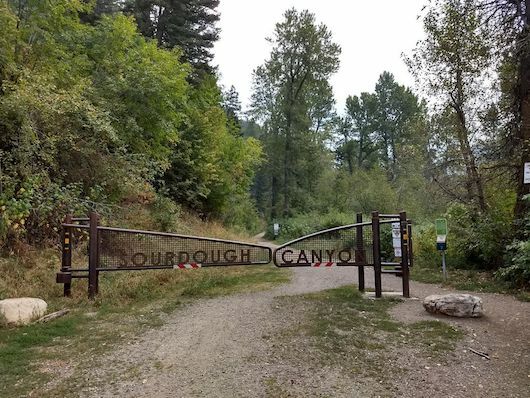 The Sourdough Canyon Trail is one of the better opportunities for a longer, hilly off-road run that’s not a trail run in Bozeman. An old fire road, labelled as Sourdough Canyon Rd. on maps, is now a wide trail that’s more of a dirt road, paralleling Sourdough Creek. The trailhead is 1 mile south of the intersection of Nash Rd. and Sourdough Canyon Rd., about 8 miles south of Bozeman. We’ve mapped 4.8 miles to the intersection of FS 979 (fire road). It’s hilly, but not too steep, climbing 620 feet with an average grade of 2.4%. Note: trail is maintained for X-C skiing in winter. One can continue even further, for a full 8 miles one-way to Mystic Lake. Follow the FS 979 fire road where Sourdough Canyon Rd. ends. This does involve even more climbing! Trailhead 1 mile south of intersection of Sourdough Canyon Rd. & Nash Rd.